Description: An Eastbound gondola train passes by the beautiful HUNT Tower under the watchful eyes of a few railfans. Description: NS primer unit leads Triple Crown Roadrailer 251 south along double main north of Dalton. Description: This eastbound manifest train crawls into Altoona and is the start to our day on the line. Description: An eastbound stack train passes through Leetsdale. Description: 38G rolls west over the railroad crossing. Above the end of the 8678 is a tipple in which had been service in the junk yard on the other side of the tracks some time ago. Description: NS general freight 38G gets an early start eastbound on track 2 of the HARL at Swedesburg under sunny skies. Description: NS 9844 passes beneath the old N&W coaling tower on the main line through Prichard WV. Description: A CSX grain train drop off at CGB. Description: NS 503 exits Galitzin tunnel on a grey August afternoon. 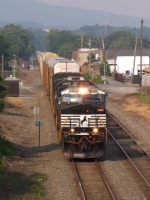 Description: The NS 9844 leads a northbound train on the NS Marion Branch at 23rd Street. Description: NS 144 heads North on the Marion Branch just south of CP-79. Description: NS D9-40CW 9844 and 8-40CW 8344 power train 64J. Description: NS 65J heads west with the same power I saw on the 64J in Lilly on January 18th; 8-40CW 8344 & D9-40CW 9844. Description: Behind the VFW, 0749 hours. Description: Lehigh Road, 0825 hours. Description: 19K heads west on the NS Huntington District at Thorne Street.